I bought an ebook (“Compact Castles”). The book is over 80 pages of detailed floor plans and descriptions for 15 different real world small castles around the world. It value easily exceeds the $8 I spent on it and I would highly recommend it to everyone interested in creating maps of smaller castles and forts. I was so excited with the purchase that I recreated one of the Desert Forts profiled in it (Nob Biranit was a fort in ancient Israel). I created it in CC3 and utilized a bunch of objects found in the CSUAC and Dunjinni Forums…I then put all 3 floors together and added some text in Photoshop. In retrospect, I probably should’ve expanded the size of the rooms a bit for game play (but real world forts were apparently really quite small). I also should’ve added a water source and stables (for camels) either inside or outside…but I think it will still make for a cool encounter for my PCs. Categories: Desert | Tags: CC3, Compact Castles | Permalink. 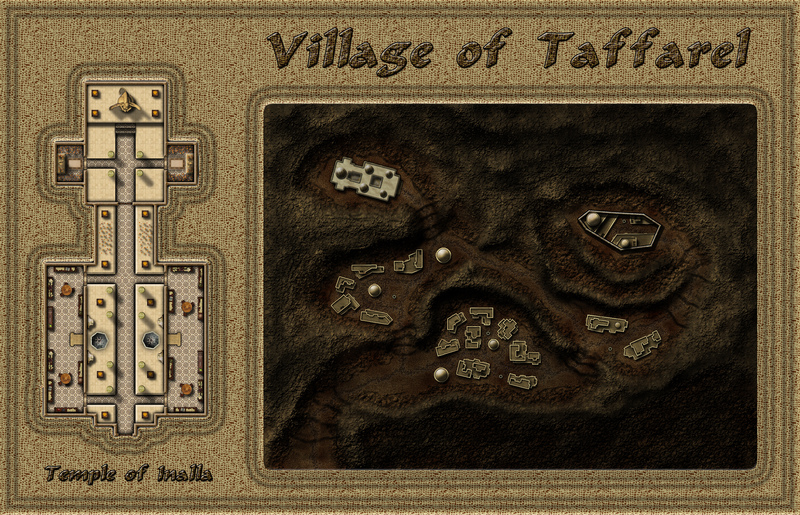 The “Village of Taffarel” was my entry into the Cartographer’s Guild September/October 2012 Lite Challenge. The challenge was to create a village map which depicted a secret of some kind. 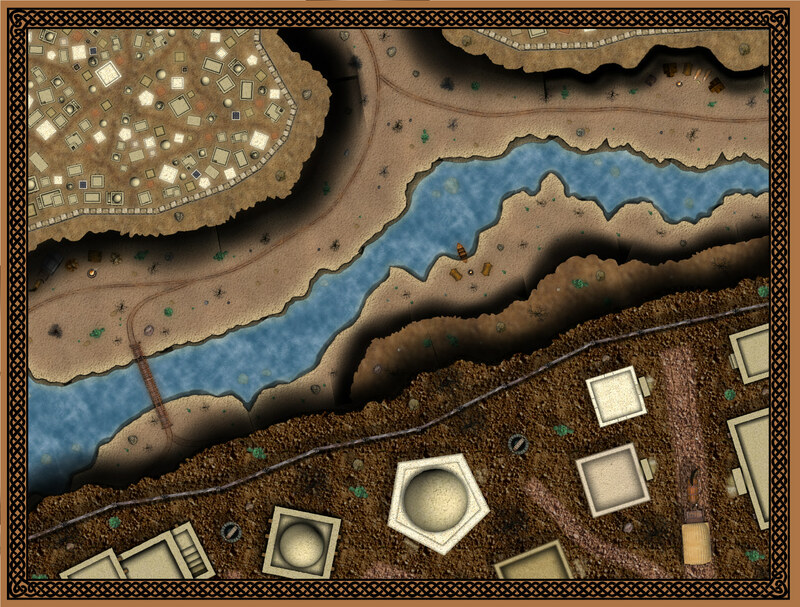 This village is situated on a series of small plateaus in a mountainous region of my Al-Qadim campaign. Its sort of a frontier outpost that sits near the mountainous boundary between semi-arid planes of the north and brutal desert to the south (Al-Qadim proper). It is therefore largely autonomous and informally ruled by a large extended family whose elders are the head priests of the local temple. The villagers themselves are primarily former nomads who have settled in this area for protection from other nomadic bands and tend livestock. This map contains two secrets (although they were not depicted explicitly). Unbeknownst to outsiders or the average villager is that this ruling family is actually a clan of Lycan (Were-Hyenas) who have been terrorizing many of the nomadic tribes and small villages in the surrounding area. Furthermore, the local temple is a shrine to “Inalla” who is commonly known as a goddess of nature, survival and instinct, but lesser known as the patron saint of Lycans. The high priest in this temple is the Progenitor of this Were-Hyena bloodline and the family compound to the east is the home of his clan. The temple was made with CC3 and utilizes textures modified from CGtextures.com. It also relies upon symbols that can be found in the CSUAC and Dunjinni forums (Special thanks to Bogie for providing the Statue of Inalla.) The rest of the map was created in Photoshop. Categories: Desert | Tags: Al-Qadim, CC3, Desert, Photoshop, Temple | Permalink. 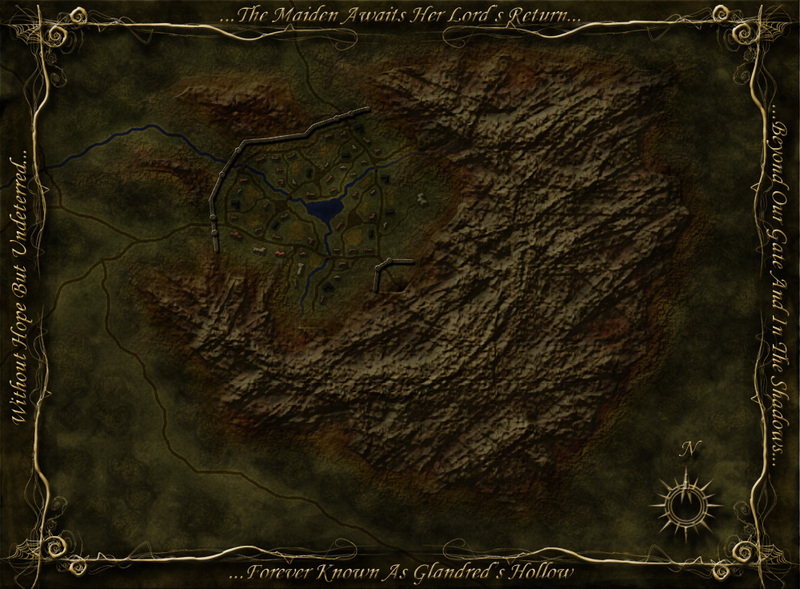 August/September 2012 Cartographer’s Guild Lite Challenge Winner! The challenge was to create two maps on the same image which depicts something before and after an event. The inspiration for my entry came from a documentary I had seen on the History Channel a few months before. Part of it discussed the legend of the ancient desert city of Ubar (which some believe to have been in modern day Oman.) The basic story is that this thriving trading center in the middle of the desert eventually collapsed on itself as the Oasis depleted. (i.e. the water cavity beneath the city which supplied the oasis eventually caved in). When I got into mapping a few weeks later, I kept thinking about how i’d like to eventually recreate the city and adapt the story to the Al-Qadim campaign that I’m running. My adaptation to the story can be found in the text of the map. The basic gist is that the city was destroyed (by a similar means) as revenge for the ruler’s betrayal of a Genie. I learned a great deal about Photoshop in doing this map and really benefited from the thoughtful comments and critiques from others on the forum. The Work-In-Progress thread can be found here. Categories: Desert | Tags: Desert, Photoshop | Permalink. This map was made using Photoshop for the Cartographer’s guild July/August Lite Challenge (2012). In the challenge you had a limited shape and color palette to work with. I arrived at the name using a Dwarf name generator program. It translates into “the lost maiden”. I used that name to develop a little back story and the lyric displayed in the border. Forever Known as Glandred’s Hollow. Categories: Mountains | Tags: Photoshop | Permalink. This is one of my earlier maps which depicts a small desert community overlooking a ravine and another city situated at a lower elevation. I haven’t developed any kind of back-story or defined the locations – but I do plan on developing a region in my world in the future where the geography is similar to this (i.e. plateaus of varying elevations in close proximity). Made with CC3. Cliffs were done using overlays downloaded from the Dunjinnin Forums. Most objects can either be found there or in the CSUAC. Categories: Desert | Tags: CC3, Desert | Permalink. Custom Miniature Building For Sale!